Like us the tree has roots in the earth and aspires to the sky. The Tree Card promises us growth. It encourages us to fulfil a potential psychologically and spiritually. 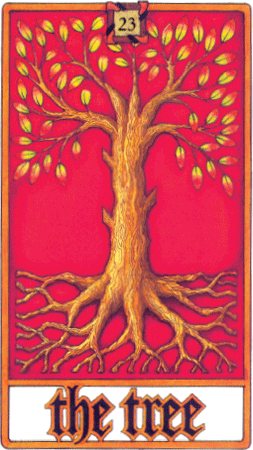 Growth comes from the balance between roots and branches; health and happiness need to be fed from the roots deep within the unconscious of our past, and our energies flow in an integrated system.